Here's a card I've been working on for our Sideline Demonstrator Meeting Swap. 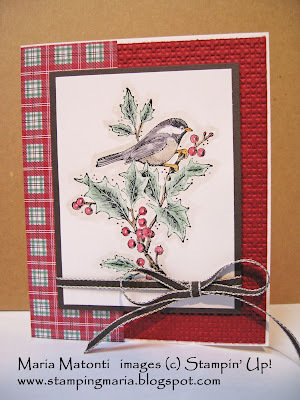 I LOVE this Beautiful Season stamp set; the holly and chickadee are awesome! I wanted to color the leaves using Old Olive, but that color clashed with the Frostwood Lodge paper, so I used Garden Green instead. 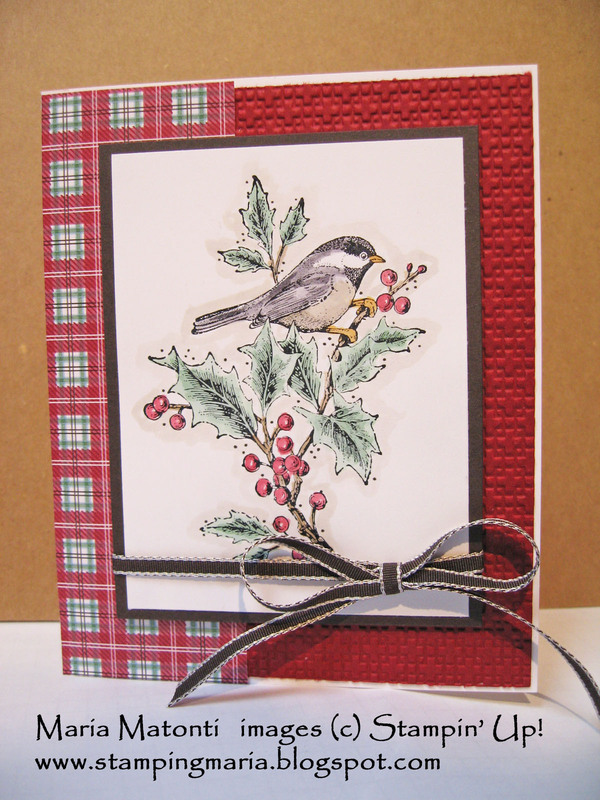 Inside I stamped the phrase included with the stamp set: "May your season be Blessed with all things bright & beautiful". Also, you can't see it well in the photo, but I used Crumb Cake around the image to give it a shadow. Paper: Frostwood Lodge DSP, Cherry Cobbler, Early Espress, Whisper White. Ink: Black Stazon, Early Espresso, Garden Green, Soft Suede, Crumb Cake, Basic Gray, More Mustard. Accessories: Big Shot machine, Lattice Embossing Folder, 1/8" Espresso Taffeta ribbon, Aqua Painter, Dimensionals, and SNAIL. Thanks for visiting & have a great weekend!